SAFe® (Copyright © Scaled Agile, Inc) is a body of knowledge of principles, practices and competencies for Lean, Agile and DevOps. The framework is built on the foundations of Agile and provides a structured approach for scaling up the practices across the enterprise. 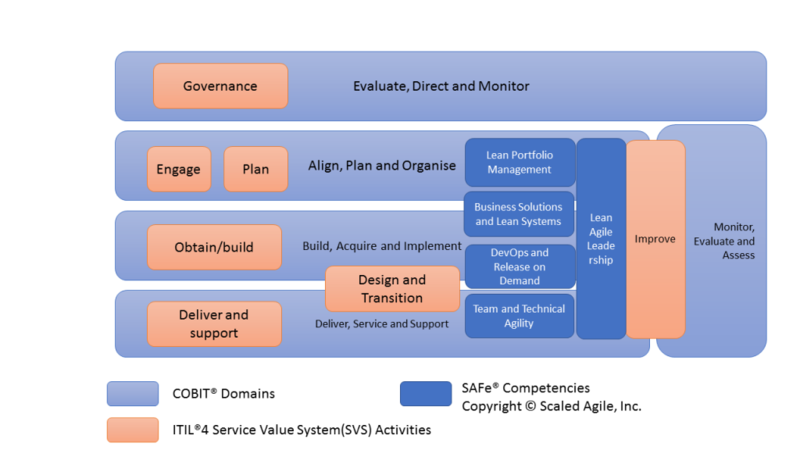 SAFe spans across all life cycle stages of ITIL and corresponding COBIT domains. As SAFe principles and practices are leverage from Lean, Agile, Enterprise Architecture, DevOps practices, the emphasis is on Agility. The waterfall and control practices of ITIL, COBIT are not emphasised. SAFe defines five competencies and four configurations. The configurations provide a clear blueprint for scalability which was lacking in other Agile frameworks. SAFe is released on 2011 and has gone periodic revisions. The industry adoption among large enterprises, especially in the USA is cited. As the scope of SAFe is quite broad, there are no dedicated tools to support. However, the tools that support Agile can be leveraged. It will be good to get an integrated tool that supports the full spectrum of SAFe practices including Lean Budgets, Value Streams, Enterprise Architecture, Release Train Management etc. SAFe provides very good training support including certification. Accredited trainers are available in many countries. SAFe is not intended for a formal assessment. SAFe is organised based on competencies and “configurations”. There are five competencies. Technical agility, the second half of this competency, defines the Agile Software Engineering principles and practices teams use to deliver solutions quickly and reliably. Agile Software Engineering adds Lean-Agile values and principles and eXtreme Programming (XP) practices, agile modeling, proven approaches for software design, and more. Configurations are determined depending of the scope of the implementation. The Portfolio SAFe configuration provides the Lean Portfolio Management competency which aligns portfolio execution to enterprise strategy. It organizes development around the flow of value through one or more value streams. SFIA skills includes both predictive project management (water-fall approach) and adaptive approaches like Agile. SAFe provides a wide range of training courses. SAFe essential can be implemented with existing Agile tool sets.